This help sheet will explain the process for creating a backup of your data within CF Enterprise. 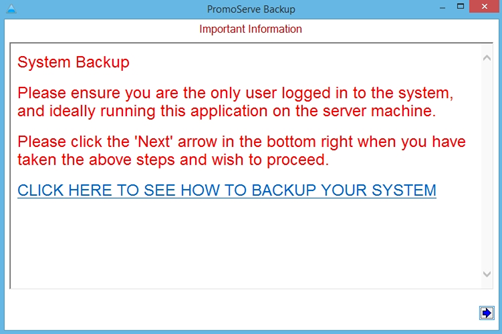 1 - All users must be logged out of the PromoServe system before a backup can be taken. Performing a backup when any users are still logged in may result in data corruptions & possible loss of data. 2 - The backup process described below is NOT AUTOMATIC. 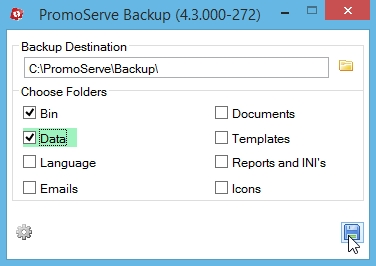 This help sheet details how you can take a manual backup of your PromoServe system. 3 - Backups should always be made from the PromoServe server machine. 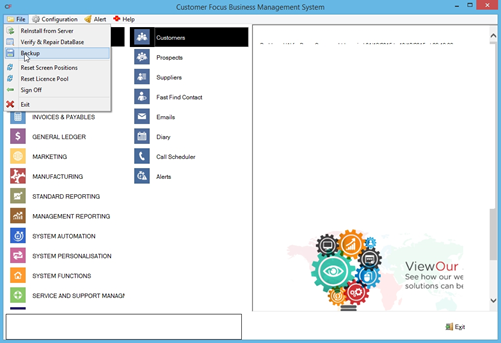 Ensure you are logged onto your PromoServe server machine before continuing. Log into Enterprise as normal with your User ID and password. 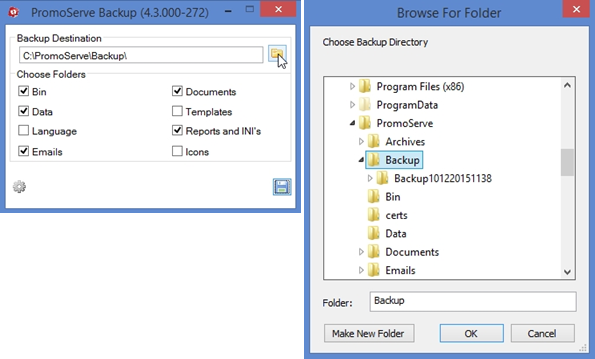 Once logged in, click ‘File’ in the top corner and select the ‘backup’ option. The Important Information screen will now be displayed, notifying you to ensure all other users are logged off of the system and that the backup is being run from the server, if possible. Click the blue arrow in the bottom-right when you are ready to proceed. Once you have selected which areas you wish to back up, click the folder icon to the right of the Destination file path. This will bring up a small Windows explorer window. Navigate to the folder where you wish the backup to be saved once completed. Once you have specified a location and are happy with the areas you are backing up, click the floppy disk icon in the bottom-right of the backup window to begin the backup process. A progress bar will be displayed letting you know which areas are being backed up and how close to completion the process is. NOTE: When a backup operation is run, Enterprise is closed down to ensure no files are in-use. 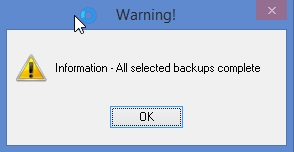 Therefore you will have to reopen and log in to Enterprise once the backup is complete.